DIY organic face masks made super easy. The hands-on approach is streamlined into a two-ingredient capsule; just a few steps and your mask is ready. 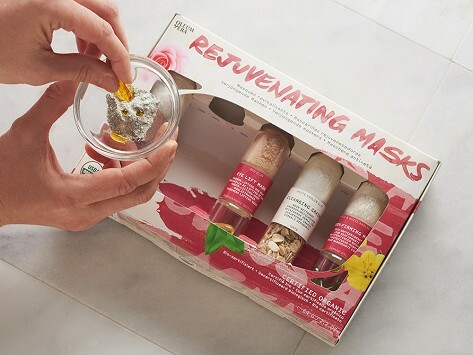 You can customize a mask for your complexion and there is enough fresh, all natural goodness in this set to mix up 15 skin-pleasing masks. Dimensions: 13" x 9.8" x 5.5"
Great for sensitive needy skin! Oleum Vera is passionate about freshening up your beauty routine for the better of your skin and for the earth. They pack only organic ingredients into their oh-so-easy DIY face masks. Each capsule has two ingredients with enough to make three masks. You can customize one for your complexion by adding more or less. In just a few steps, you’re ready to get your mask on. Pick from masks like the Detox, which combines spearmint and green tea with white kaolin clay, and will leave skin feeling squeaky-clean. Or try the rose petal-infused Anti-Age mask, which you can apply just under the eyes as a targeted treatment. The gift set has a variety of skin-pleasing masks to try if you can’t pick just one. Who knew being your own organic aesthetician was so easy—and so much fun?